Enable Leads Module: Allows you and your team to use the Leads Module. 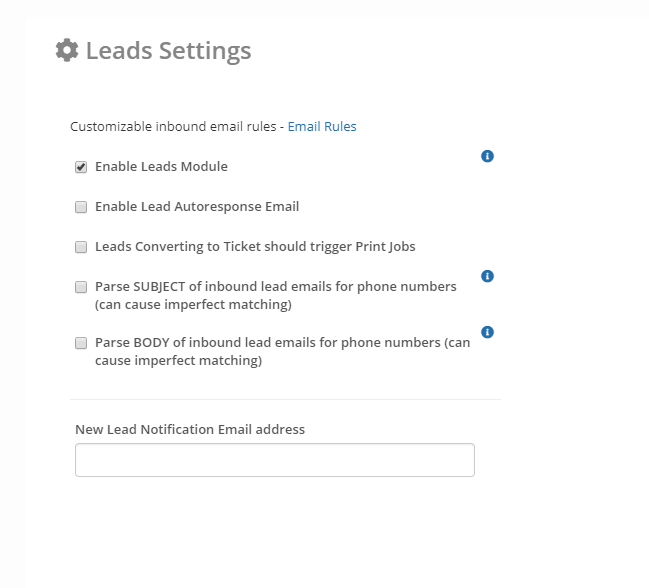 Enable Lead Auto response Email: When a Lead is generated a automatic response will be sent back to the customer. You can edit the template by navigating to Admin > PDF/Email Templates > Lead Auto Response. Leads converting to Ticket should trigger Print Jobs: When enabled will send a print job when a Lead is converted to a ticket. Lead Notification Email Address: This email will be alerted when a new lead is generated.